Issues related to the demolition of single family homes remain a concern for many in our coalition and in neighborhoods throughout Portland. In June, Southeast Uplift and three other neighborhood coalitions organized a forum to discuss infill, demolitions, and housing affordability. About 200 people from neighborhoods across Portland attended. You can watch a video of the forum here. In his presentation at the forum, Shawn Wood, a Construction Waste Specialist with the Bureau of Planning and Sustainability, provided some numbers to help put into context what we are seeing in our neighborhoods. 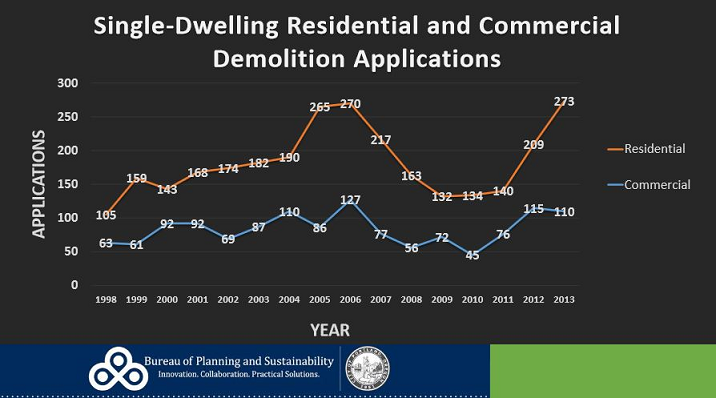 In 2013, the city received 273 demolition applications for single dwelling residences. As you can see from Wood’s graph, this is a level of demolition activity that has not been seen since 2006. The graph reflects the general economy and the housing market. When the economy and housing market are stronger, there is more construction and more demolitions in residentially zoned properties. Demolition Permitting: The Bureau of Development Services issues demolition permits, as well as permits for new construction. If you have questions about whether or not the construction activity on a specific site is properly permitted or if you need to report a code-related violation, contact BDS. Demolition Notification: One thing I frequently hear from neighbors is that they didn’t know the house on their street was going to be demolished until the construction equipment arrived. While there are provisions in the city’s code that allow for notification and an opportunity to delay a demolition, the same provisions are waved if the demolition application for a single family residence is accompanied by an application for a building permit for a replacement single family residence. If a notification is sent, it will go to your neighborhood association and district coalition, and there will also be a notice posted at the site slated for demolition. There is also a new courtesy notification process that gives developers the option to notify nearby residents by using door hangers. BDS is the agency that oversees the notification process. Air, Environment, and Health Enforcement: With the demolition of older homes comes the issue of what is done with contaminants like asbestos and lead. While most contractors will follow guidelines to safely dispose of such materials, there are documented cases in our coalition where this has not been the case. The State of Oregon’s Department of Environmental Quality (DEQ) is the agency that enforces environmental regulations. DEQ’s enforcement is largely complaint-driven so if you are concerned something has been done improperly you should file a complaint. The more information and documentation you have, the better. Density, Neighborhood Character, and Sustainability: The long-range planning for how and where our city grows does ultimately impact where we see demolitions and what we see being built. The Bureau of Planning and Sustainability (BPS) oversees these activities, including the current update to the city’s Comprehensive Plan. On July 21, BPS will release its recommended changes to the city’s Comprehensive Plan zoning map. It is anticipated that close to 20,000 parcels – roughly 12-15% of the parcels in the city – will be proposed for some kind of zoning change. You can sign up to be notified about the proposed changes and to comment on them here.